Now in stock! Lay Day Collection. Order yours today. 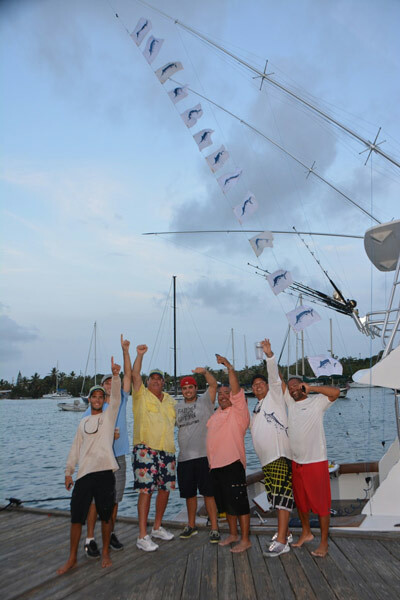 Photo ABMT5: Team Reel Affair shows off their flags signifying 13 blue marlin releases. St. Thomas, U.S. Virgin Islands. 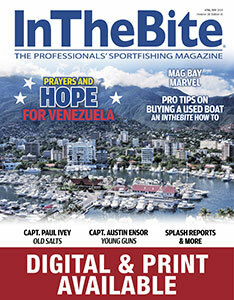 The number 13 proved lucky for the San Juan, Puerto Rico-based anglers and crew aboard the 56’ Viking, Reel Affair. This was the number of blue marlin over four days of fishing that earned owner/angler, Carlos Ramirez, and his team the Top Boat title in the 42nd USVI Open/Atlantic Blue Marlin Tournament (ABMT). “We were focused on winning the tournament right from the start,” says Reel Affair angler, Wilson Colberg, who released two of the team’s blues. Reel Affair started strong when angler, Michael Laporte, caught the first blue marlin of the tournament. The team released three more for four fish total on Day 1. 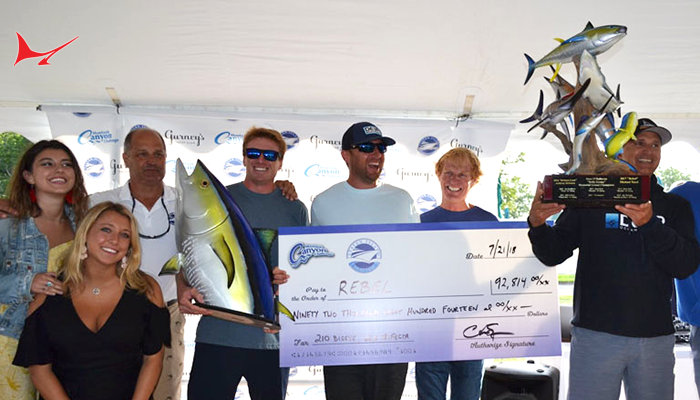 This landed them a second place on the scoreboard right behind the Miami, Florida-based team on the 68’ Paul Mann, Jichi, who released seven blue marlin. On Day 2, Jichi went fishless yet held the lead with seven fish while Reel Affair’s anglers keep the pressure on by releasing two more blues for six total. Meanwhile, Port Canaveral, Florida’s Jr. Davis’ and his team on his 61’ Garlington jumped into third with three releases or four overall. Reel Affair took over the lead from Jichi by Noon on Day 3 and one upped its main competitor by releasing a last minute fourth blue marlin for the day to score 10 blues total. 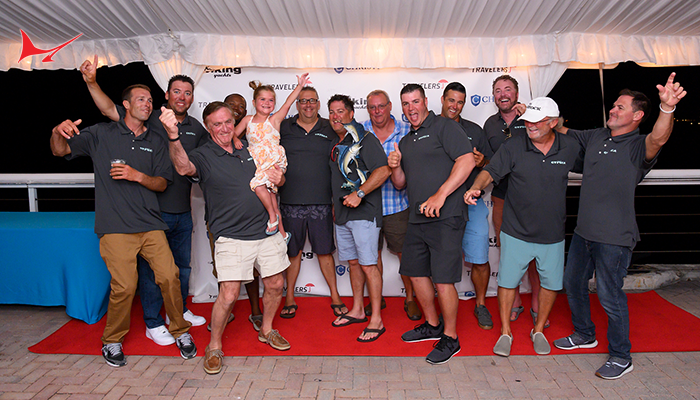 The Jichi team rebounded with the release of two blue marlin for nine total and a second place. 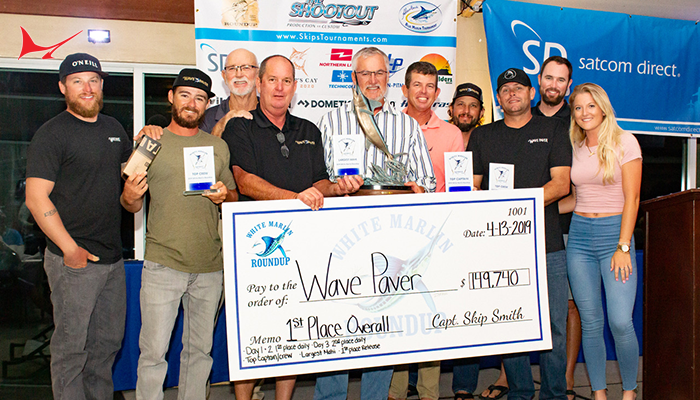 Wave Paver kept up its pursuit with another two blues for six overall and a firm footing on third place. On Day 4, Reel Affair’s Colberg kicked off a successful home stretch by releasing a blue marlin 1 minute before Jichi’s anglers. 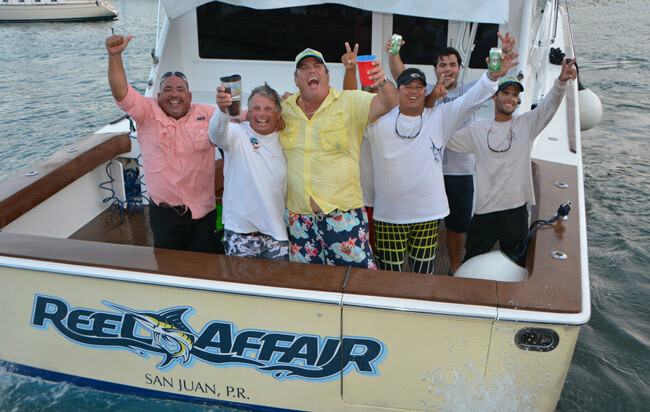 Two more releases by Reel Affair, the last in the final 30 minutes of the tournament, secured the Puerto Rican team’s win with 13 blue marlin. Jichi finished second with 11 blue marlin and Wave Paver third with 10 releases. The Top Local Boat title went to Mixed Bag, Capt. Rob Richard’s Luhrs 40 Open Express, with five blue marlin. 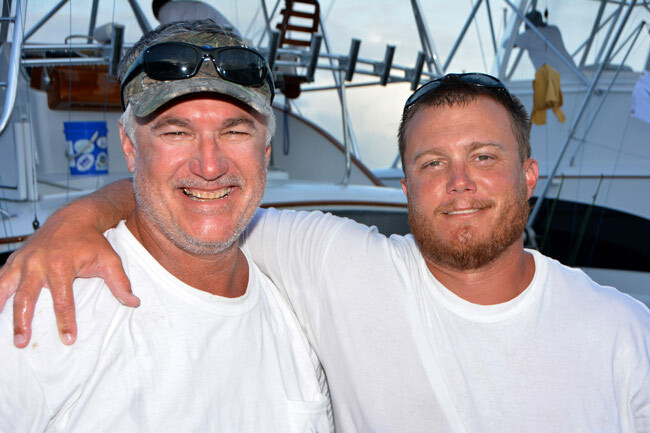 In angler awards, Wave Paver’s Steve Davis earned the $10,000 top prize by catching five blue marlin. 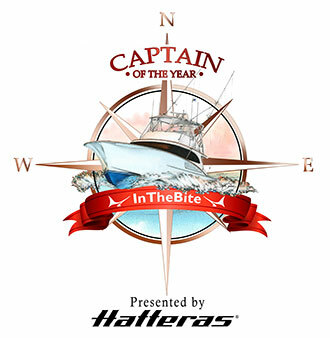 The Top Female Angler prize went to Ft. Lauderdale, Florida’s Jody Lewis, who fished aboard her and husband, Steve, Viking 64, Freebie. “I caught what I saw,” says Lewis, who has fished the ABMT many times, yet wins this title for the first time. 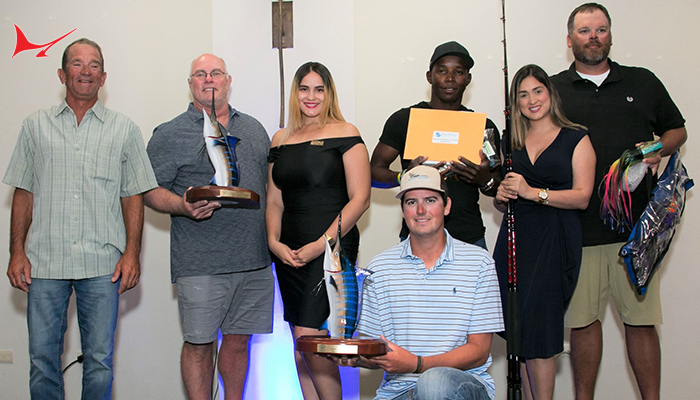 Rounding out the awards was Top Junior, won by 17-year-old Tristan Lambert, of Hillsboro Inlet, Florida, with the release of two blue marlin aboard his family’s 80-foot Merritt, Reel Tight. A total of 99 blue marlin were released by the 22 boat fleet in 4 days of fishing. 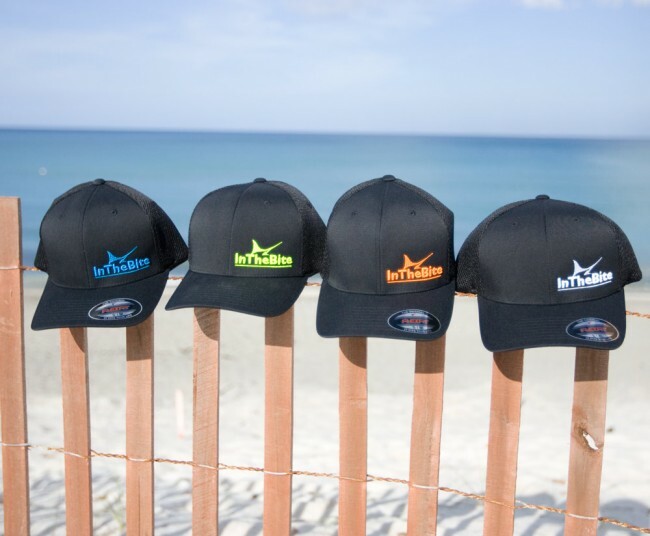 Started by Chuck Senf back in 1972, the ABMT has evolved into one of the most competitive saltwater sports fishing events in the world. 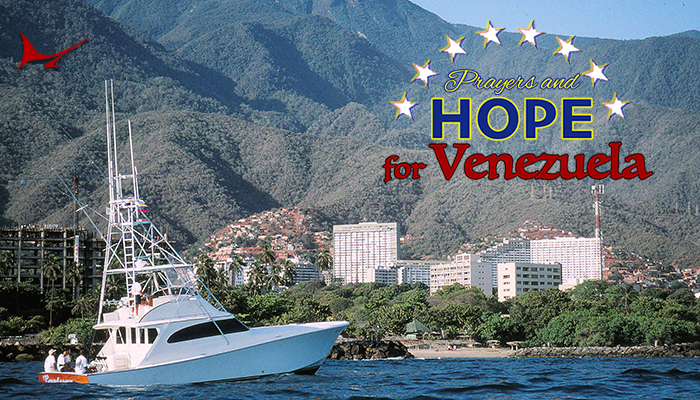 The ABMT is fished under International Game Fishing Association (IGFA) rules, and is overseen by a professional ‘Board of Captains’ and well-qualified observers. The tournament benefits the U.S. Virgin Islands Field Service Area, part of the National Capital Area Council of the Boy Scouts of America (BSA) and it helps to fund the Marine Vocational Program (MVP), which is operated and funded under the BSA by the organizers of the ABMT. The MVP program teaches local scouts to swim, scuba dive, sail and more in an effort to interest them to pursue a career in the marine industry. The 2nd Annual MarlinFest, a week of activities planned around the ABMT, saw the participation of hundreds of fishermen and spectators alike. A BVI day trip, Arts & Crafts Fair, Chowder Challenge, Caribbean Show and Golf Tournament were all part of the fun.